There are many things to love about frittata, which is why it makes an appearance on our dinner table at least once a week! 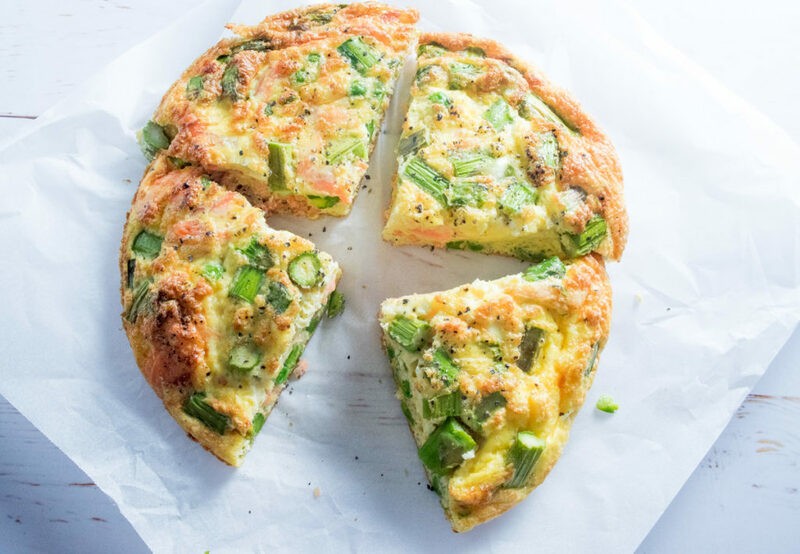 This salmon, asparagus and pea frittata is a favourite. It’s the one thing that I always have the ingredients for (eggs, yoghurt and some sort of vegetable). It’s so easy, you can mix it up in 5 minutes, pop it in the oven and dinners done. The way it puffs up when it cooks, kind of like a souffle (always makes me feel very chef-like). It’s a great way to use up leftover bits and pieces lying around in the fridge – veggies, cheese, fish or chicken, etc etc. There are no rules when it comes to fillings so you can be as creative as you like (within reason!). It’s full of healthy stuff – plenty of protein from the eggs and yoghurt and lots of veggies. You can bump up the carbs too by adding in potato, sweet potato or corn or serve it with some sourdough or wholemeal bread for a totally balanced meal. It also goes really well with a salad if you want to up the veg even more. 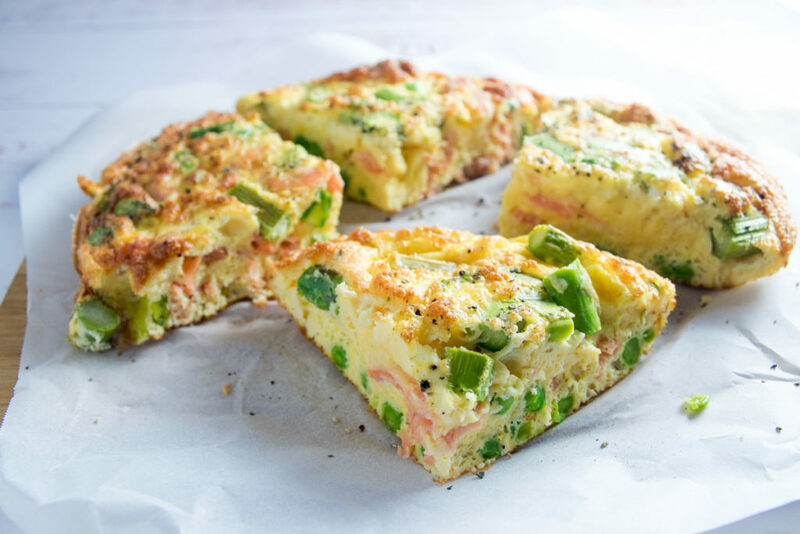 Another thing to love about this salmon, asparagus and pea frittata is that unlike other frittata recipes, it’s cooked entirely in the oven. This means there’s no standing over the stove wondering if it’s burning on the bottom even though it’s still all runny on top, and then putting it under the grill only to burn the top and then find it’s not remotely cooked in the middle 🙁 Just pop it in the oven and forget about it for 15 minutes, then wonder at the golden brown, puffed up beauty before you! Place eggs and yoghurt in a bowl and beat until well combined using a fork or whisk. Spray a medium sized baking dish or oven proof frying pan with oil and pour in egg mixture. Bake for 15 minutes or until golden brown and just cooked through. Serve with salad or crusty wholemeal or sourdough bread.